A report that usually shows the principal and interest allocation of each monthly payment during the first year,the total principal and interest paid in each subsequent year, and the total interest that will be paid over the life of a loan. Download a template for creating loan amortization reports by going to the Microsoft Excel Web site at http://office.microsoft.com/en-us/templates. The loan will have an initial three-years of interest only payments, followed by a 30-year amortization schedule and will be used to pay off the existing loan with cash-out proceeds being used to continue remodeling the property. Both loans were based on a seven-year term with a 30-year amortization schedule and arranged for the borrowers, Trees of Kennesaw LLC and Tree Corners LLC, through NorthMarq's seller-servicer relationship with Freddie Mac. Callies bought several investment properties through accelerated payment plans, but she is paying the mortgage on her current primary residence according to the original amortization schedule to keep one tax deduction. If an issuer does not need to calculate the OID separately, only one amortization schedule is needed to determine the total deduction for interest and debt issuance costs, lf an issuer, however, must report OID to holders or must calculate OID to apply certain interest limits, it will have to construct both schedules, because debt issuance costs are not considered OID. 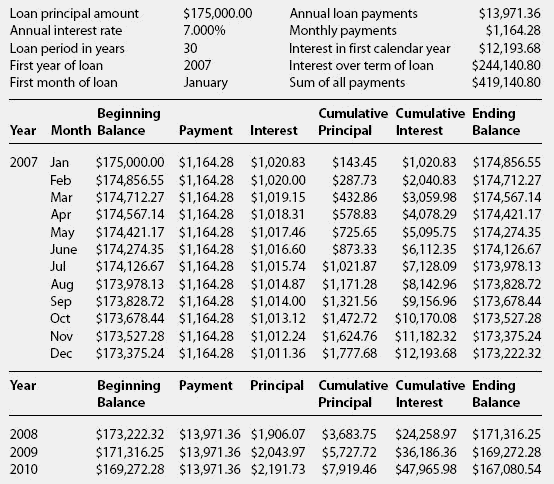 Therefore, the remaining principal balance of a debt amortization schedule under the rule-of-78 method would be greater than that of the unpaid principal balance method. So you are allowed to force the lender to keep the loan on his books and to pay over time, even if the amortization schedule and interest payments are different from the original loan. The Option ARM borrowers have four payment options: interest only (IO), minimum monthly payment (MMP), principal and interest payment based on a 15-year amortization schedule, and principal and interest payment based on a 30-year amortization schedule. 43 per square foot and a short, 20-year amortization schedule which provides for significant principal paydown over the term. The loan features 170 BP's over the 10 year swap with a term of 10 years, 30year amortization schedule. The Option ARM borrowers have multiple payment options: interest only (IO), minimum monthly payment (MMP), principal and interest payment based on a 15 year amortization schedule, and principal and interest payment based on a 30 or 40 year amortization schedule. Discussions are ongoing between the borrower, special servicer and originator over a possible resolution to the issue of the loan's amortization schedule, which was drawn up incorrectly at origination. The transaction was structured with a 7-year term and 30-year amortization schedule.